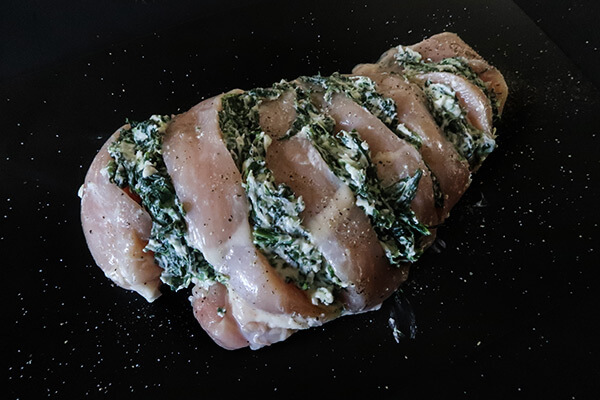 What if I could give you a stuffed chicken recipe that has no rolling, no twine, no pounding with the mallet, and best of all – no hassle! This easy dinner recipe will fit the bill. 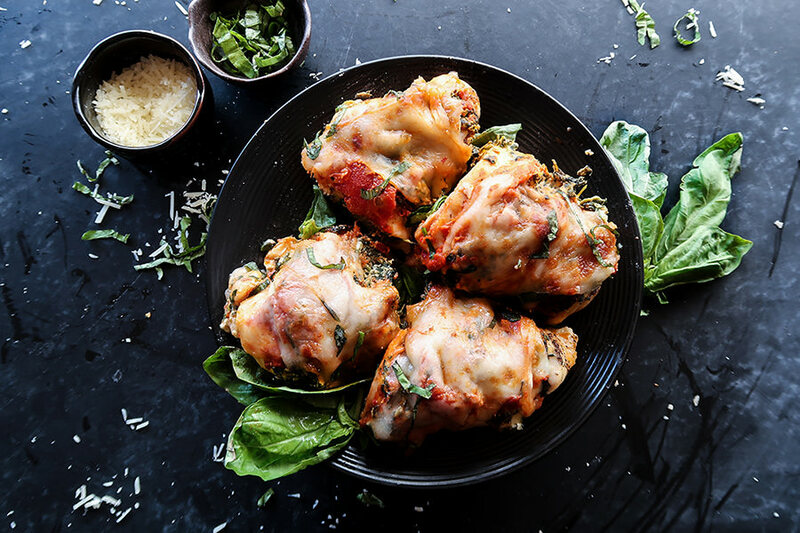 The chicken breasts are sliced accordion style and then stuffed with spinach and cheeses. 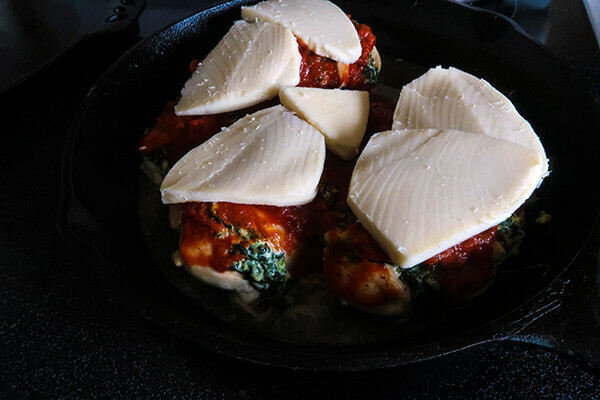 Then it’s topped with tomato sauce and mozzarella, and put under the broiler to get brown and goey. This recipe is based off a chicken recipe that a family member taught me. She would use thinly sliced chicken breasts to make a stuffed rollatini. The pieces were breaded and baked before being topped with sauce and cheese. I still love that recipe and can recall the creamy filling from memory, but I wanted to make a version that was less fussy. That’s when I thought of hasselback chicken! Best I can tell, hasselback foods originate with a special preparation of potatoes. 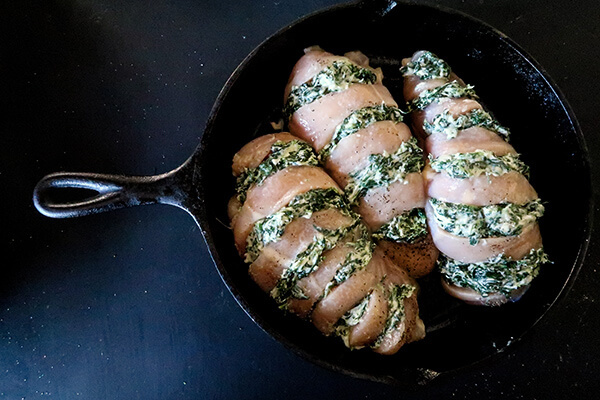 I have no idea who made the original hasselback chicken recipe, but I love it every time I see different versions pop up on Pinterest. The stuffed and sliced chicken breasts look so fancy, but you know it’s easy to prepare. Whip this up for a decadent weeknight meal. 1. Pre-heat your oven to 400°F. 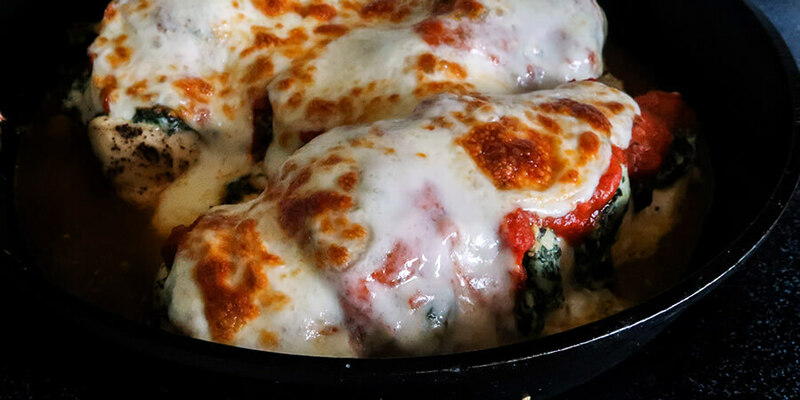 Place the cream cheese, mozzarella, and spinach in a microwave safe bowl. Heat for about 2 minutes, or until the cheeses get melty and can be easily mixed together. Mix the filling and add salt and pepper to taste. 2. 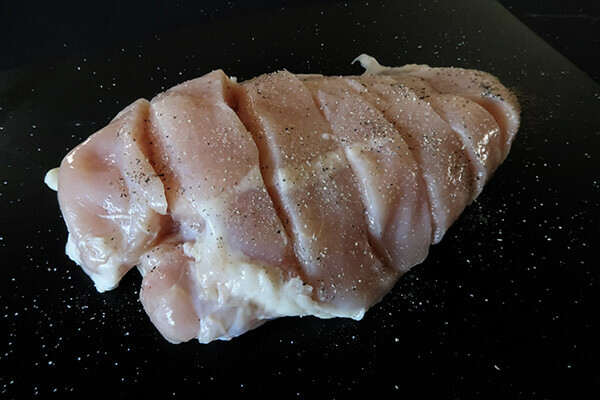 Cut several horizontal slices across each chicken breast, Cut as deeply as you can without slicing all the way through the chicken. Season the chicken with salt and pepper. 3. Stuff each piece of chicken with the cheese filling. 4. Brush some olive oil onto the bare chicken tops. Cook for 25 minutes, or until chicken reaches 165°F. 5. Change your oven to the broil setting. Top with Rao’s tomato sauce, and the slices of mozzarella. 6. Broil for 5 minutes, or until the cheese gets melty and starts to brown. 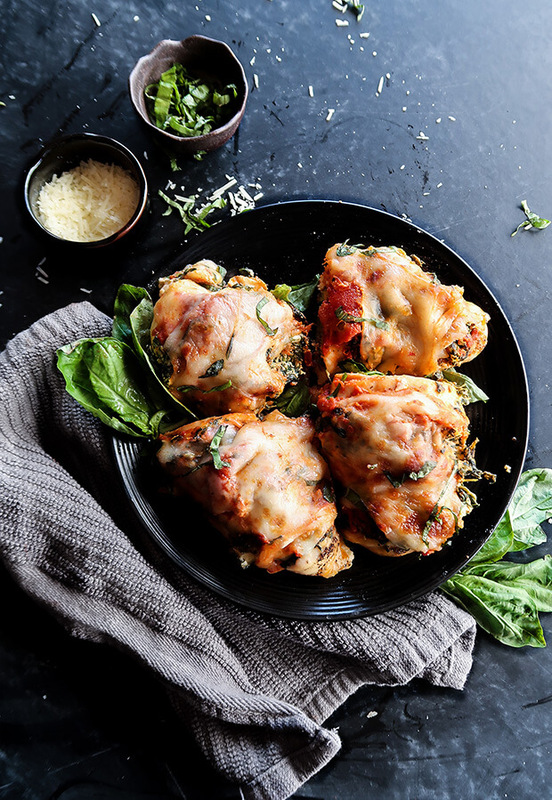 This makes a total of 6 servings of Hasselback Marinara Chicken. Each serving comes out to be 338 Calories, 18.28g Fats, 2.56g Net Carbs, and 37.96g Protein. Pre-heat your oven to 400°F. 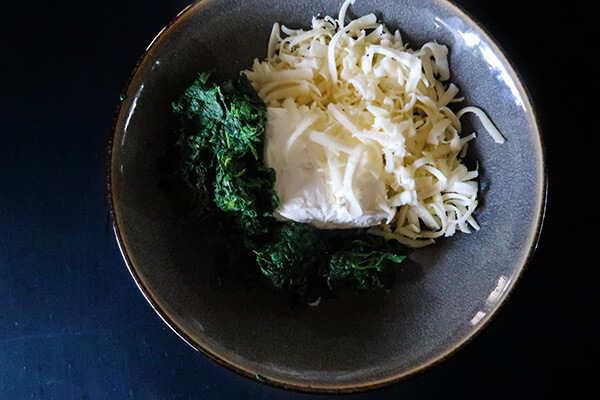 Place the cream cheese, mozzarella, and spinach in a microwave safe bowl. Heat for about 2 minutes, or until the cheeses get melty and can be easily mixed together. Mix the filling and add salt and pepper to taste. Cut several horizontal slices across each chicken breast, Cut as deeply as you can without slicing all the way through the chicken. Stuff each piece of chicken with the cheese filling. Brush some olive oil onto the bare chicken tops. Cook for 25 minutes, or until chicken reaches 165°F. Change your oven to the broil setting. Top with Rao's tomato sauce, and the slices of mozzarella. Broil for 5 minutes, or until the cheese gets melty and starts to brown.